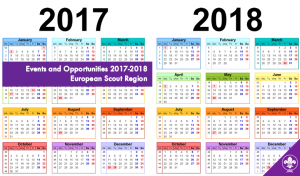 The European Scout Region of the World Organization of the Scout Movement (WOSM) is pleased to share with you a list of proposed events agreed by the European Scout Committee (annex 1 of Regional Circular 23 2017). There may be some changes to the list, but it was felt that it was important to share a comprehensive a list as soon as possible to assist in your planning. In annex 2 of Regional Circular 2017 you will find a list of possible applications for grants allied to the published deadlines where we anticipate the calls for participation to come (Annex 2). We hope this will at least give you a heads up before the formal calls are launched by the grant giving agencies.